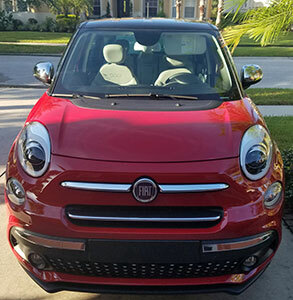 For our drive to Mickey’s town from Tampa, the 500L cruised with a 1.4-liter turbo inline-4 cylinder engine putting out 160 horsepower and180 pounds-feet of torque. Mated to a fine 6-speed auto gear box, the cheeky-styled 500L (base-priced at $23,895) provided us a comfortable drive while surrounded by a sumptuous and cavernous cabin. Next up was a taste of “Germany” at the nearby old-town Yalaha Bakery (www.yalahabakery.com) for lunch in the outdoor biergarten. What about Italy, you ask? No worries. After the sun set and the stars came out, the Italy Pavilion at the Epcot Center Showcase served up delicious desserts as the park’s nightly fireworks lit the sky. 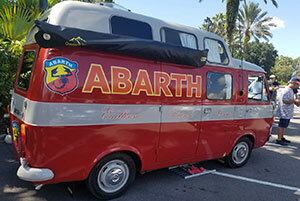 For the concourse and the “Feast of a Hundred Fiats” banquet that evening, Anneliese Abarth, who was wife and partner of the late automobile designer Carlo Abarth, made an appearance. She and Carlo met in the early 1960s and quickly became close. In fact, Anneliese, who was always present at every test and race, became Carlo’s favorite photographic model. Carlo, who founded the high-performance Abarth, sold the company to Fiat in 1971. 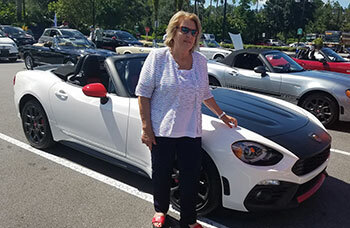 Anneliese, a lifelong car enthusiast, now runs the Carlo Abarth Foundation and successfully carries the baton passed on by her late husband. As brand ambassador, she actively represents the high-performing Abarth cars at classic car events and international club meetings. 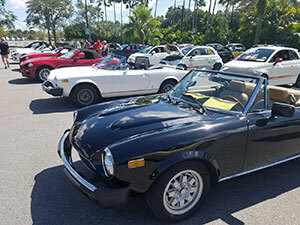 It’s about keeping the Fiat heritage alive, she says. Anneliese said it’s difficult and different in the United States to keep Abarth in the limelight. She dreams that one day, there will be an Abarth museum. “We have to get more messages out,” said the owner of a 500X AWD, a birthday gift from the Fiat company. 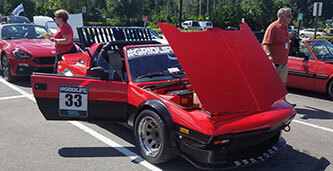 And that is the reason she attended, signed autographs and spoke to the 400-odd Fiat Freakout audience in Orlando, a delight for Fiat club members and aficionados. ALL-NEW SUBARU ASCENT WILL TAKE YOU TO NEW HEIGHTS! Move over Toyota Highlander, Honda Pilot and Mazda CX-9. There’s a new midsize SUV in town (i.e. on the road) and it shines. 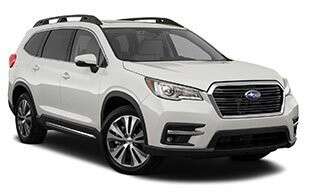 Meet the 2019 Subaru Ascent, a family hauler that has replaced the long-forgotten Tribeca. The aptly-named Ascent delivers a well-composed ride with strong acceleration, remarkable handling and steering feel. Of course, a standard all-wheel-drive system ensures superb balance in all driving conditions. A 2.4-liter horizontally-opposed 4-cylinder engine produces a healthy 260 horsepower @ 5600 rpm and 277 pounds-feet of torque @ 4800 rpm. Power routed through a continuous variable transmission with 8-speed manual-shift capabilities contributes to an adequate performance. An independent MacPherson strut front and a double wishbone rear suspension results in a delightfully supple ride. Steering response with the rack-and-pinion power assist is sharp, precise and perfectly weighted. The Ascent’s exceptional stopping power comes from robust 13.1-inch ventilated front and 13-inch rear discs. Up front, the Subaru star cluster insignia centered on a traditional hexagonal grille is flanked by C-shaped HID headlights. Ambient foot well lights greet occupants entering the top-notch cabin. A twin cockpit with electroluminescent gauge displays for speedometer, tachometer, fuel and coolant temperature give the interior a rich ambiance. The 40/20/40 second row Captain’s seat slides forward so passengers have trouble-free access to the 50/50 third-row seat. Passenger volume is cavernous at 153.5 cubic feet. And there are an astonishing 19 cup/bottle holders and eight USB ports with cubbies and bins throughout. Other standard niceties include 10-way power driver and four-way front-passenger cooled/heated seats, panoramic power moon roof, 8-inch touch screen for nav, audio and phone controls, tri-zone auto a/c, power rear lift gate, matte wood trim and a leather steering column/shifter. Dual front and side airbags, side curtain airbag for all three rows, driver knee airbag, EyeSight (adaptive cruise control, pre-collision braking, lane departure warning and lane keep assist), blind spot detection with lane change assist and rear-cross traffic alert, four-wheel antilock brakes with electronic brake distribution and brake assist, rollover sensor, vehicle dynamic control, active front seat head restraints, front view (180-degree view of front) and smart rearview monitors, tire pressure monitoring system and daytime running lights are standard in Touring trim. Families looking to accommodate their precious little ones comfortably in the rear seats will take to the Ascent. A spacious passenger- and cargo-hauler boasting a solid and safe ride, coupled with an airy cabin, make this SUV an outstanding buy. 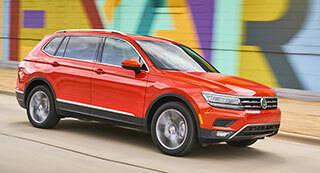 REDESIGNED VW TIGUAN IS A SURE HIT! It’s an all-new Tiguan for 2018 with a revamped power train, plenty more cabin space and a standard third-row seat. Under the hood sits a sole turbo and direct-injected 2.0-liter inline-4 cylinder engine putting out 200 horsepower @ 5100 rpm and 207 pounds-feet of torque @ 1800 rpm. It’s quick off the mark, responding with agility in any situation. The second-generation SUV now offers an 8-speed auto gearbox (forget the previous 6-speed) Ensconced on the unitary body is a robust strut-type front and a multilink rear suspension. Available as a front-wheel or all-wheel drive, the younger sibling to the Touareg is longer than 10 inches from its predecessor. Horizontal LED headlights and daytime running lights surround the centered VW insignia. Standard roof rails will appeal to the outdoor enthusiast. The attractive cabin of the freshened SUV epitomizes European styling and flair with a simple but elegant instrument panel of large analog speedometer and tachometer gauges and a centered driver information center. Fold flat the 40/20/40 rear seat, which slides forward 7 inches, and the trunk area becomes generous. Offered standard in FWD models only, the two-passenger 50/50 third-row folds down. Passenger volume is commendable at 101.1 cubic feet. Amenities include an 8-inch touch screen for audio, nav and phone controls, panoramic sun roof, dual-zone auto a/c with second-row air vents, three-spoke leather steering column, 10-way power driver and six-way front-passenger manual seats, and a power lift gate. Dual front and side airbags, side curtain airbag for both rows, four-wheel antilock brakes with brake assist, Electronic Stability Protection with anti-slip regulation and engine brake assist, traction control, lane departure and forward collision warning, park distance control, three-point seatbelts for all positions, adaptive cruise control, overhead view camera, tire pressure monitoring system and daytime running lights are standard. Competition is fierce in the compact SUV segment but the overhauled Tiguan is one step ahead now. The turbo engine is peppy as always making for an exciting ride. The addition of a third-row seat and more cargo space should ensure that this VW is a frontrunner. The all-new X2 fills in the missing gap (rather number 2) between X1 and X3 sport activity coupes. But it is much more than just that. Our xDrive28i trim is equipped with a 2.0-liter inline-4 twin-turbo engine developing 228 horsepower @ 6000 rpm and 258 pounds-feet of torque @ 4500 rpm. Translation: 0 to 60 mph in 6.3 seconds for a vehicle weighing 3,662 pounds with a top speed of 130 mph! The xDrive all-wheel-drive system works to distribute torque between the left and right rear wheels. Providing smooth shifts in the five-seater is an 8-speed auto gear box with manual mode. A standard variable rack and pinion steering system affords outstanding feedback. Fear not about low gas mileage since a stop-start function allows the car to save fuel by shutting off the engine. To access your driving choice of eco pro, comfort and sport modes, just turn the center control knob. High-gloss black contrast with the grille’s chrome surround accent. Also standouts are signature twin-round HID adaptive headlights with LED corona rings. Step inside and you will find yourself ensconced in confidence-inspiring 10-way power front seats. The iDrive console knob to control navigation, entertainment, communication and climate systems is simple to understand and use. A thick-rimmed three-spoke power steering wheel conveys a solid touch to the driver, inspiring confidence in the sprightliness of the vehicle. Also standard are a three-spoke leather-wrapped steering column, power tailgate, anthracite headliner, power tailgate, huge under-floor cargo bin, center armrest, ambient lights and dual auto a/c. Dual front and side airbags, side curtain airbag for both rows, four-wheel antilock brakes, stability, traction and dynamic cruise control, rearview camera, rollover sensor, tire pressure monitoring system and daytime running lights are fitted at no extra charge. Want to switch lanes on a busy highway? You may encounter a few visibility issues in the low-slung X2 with its coupe-style roofline. And cargo space may be quite paltry at 21.6 cubic feet (behind rear seat). 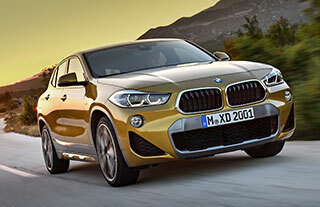 Otherwise, the X2 is a superb blend of performance and sophistication. It’s been over three years since the Yukon Denali XL was redesigned. For 2019, GMC has incorporated some new colors but otherwise the full-size SUV continues as is. With a powerful engine under the hood, the body-on-frame ride accelerates quickly from any speed. We dig the active noise cancellation feature, which guarantees silence and poise at highway speeds. A 6.2-liter V-8 Ecotec engine, coupled with a 10-speed (previous one was 8) auto gearbox, blasts off 420 horsepower @ 5600 rpm and 460 pounds-feet of torque @ 4100 rpm. An independent coil-over-shock front and a solid axle multilink rear suspension work well to eagerly tackle sharp, sudden curves on the road. The power rack-and-pinion electric power steering has a trusty feel. The Active Fuel Management system deactivates four of the eight cylinders for fuel savings. Tow capacity is an impressive 7,900 pounds. Up front, familiar C-shaped HID headlights flank the enormous chrome-accented grille. Also apparent are the familiar vertical tail lamps and rear chrome bar with GMC etching, body-color side moldings, fog lamps and a wider rear track. Step into the capacious cabin and you will realize there is no need to remove the third-row seat. Instead, press a button in the cargo hold and watch the bench fold. Ditto for the second-row seat. That leaves you 121.1 cubic feet of space behind the first row with the two seats down. The two-gauge analog instrument cluster is well-lit and crystal clear. And the huge center console can swallow a laptop. Other notable features include tri-zone auto climate control, power tilt/telescopic steering column, 8-inch color touch screen for audio, navigation and Intellilink readings, 10-speaker Bose surround system, heated/cooled front seats, wood trim on dash and doors, several USB slots and a 110-volt outlet. Standard safety features include dual front and side airbags, side curtain airbag for rear rows, stability control with hill start assist and traction control, four-wheel antilock brakes, rearview camera, rear-cross traffic, forward-collision and side-blind zone alerts, lane departure assist/warning, Magnetic Ride Control, front/rear park sensors, auto-locking rear differential, tire pressure monitoring system and daytime running lights. 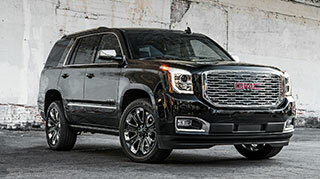 The Yukon Denali XL boasts plentiful room for cargo and passengers, praiseworthy tow capacity backed by a potent engine. Turn a blind eye to the fuel economy figures (14 mpg city/20 highway) and this full-size SUV will serve the needs of big households quite well.